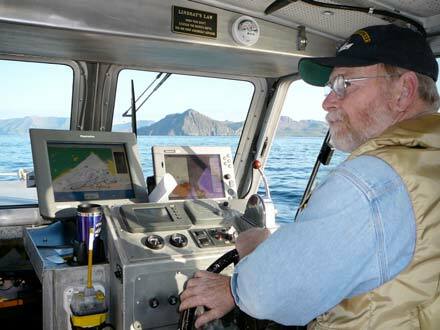 Ron Walker, our experienced driver, maneuvers our boat through the turns. The crew is working hard to finish sheet B, which is full of completed polygons, with a few remaining to be worked on. Launch 1018 went to work on three of those areas today. Captain Ron drove us to our destination and ENS Wendy Lewis started the computer system. Two of the areas we were assigned were low water areas that can only be navigated by an experienced cox’n. Good thing Ron was heading up our boat. He is as experienced as they come. To start our work we had to lower our transducer, which enables us to send out sonar beams that bounce off the ocean floor. Those beams bounce back to show the shape of the ocean floor. We deployed our CTD (conductivity, temperature, depth) device three different times to get accurate readings on the conditions of the ocean that might affect our data collection. Surprisingly, we completed our assignment early and got to head in for lunch. Today was whale day! Captain Ron promised me whales and he delivered even before we heading out this morning. As we stood on the fantail of the ship for the morning meeting, Ron pointed out a humpback breeching off in the distance! 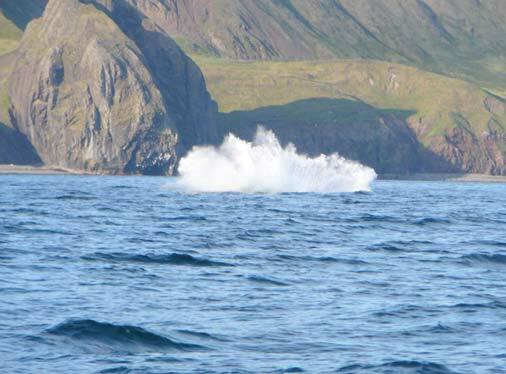 Then as we cruised at 8 knots surveying our area, a large humpback put on a great show for us! He surfaced again and again, showing off his immense tail fins. What a large splash he made! I was able to watch him for nearly thirty minutes and captured some great video of the spectacular scene. I had yet to see the grand prize of Alaskan marine life: the Orca, but whale day wasn’t over yet. As we idled off the northwest corner of Andronica Island completing our data for the day, a small pod of orcas came to play between our boat and the coast. I could see the white patch on their side and their characteristic dorsal fin. I was so thrilled! Again, I had an amazing day out in the Alaskan seas. Am I really going to have to leave here?!? 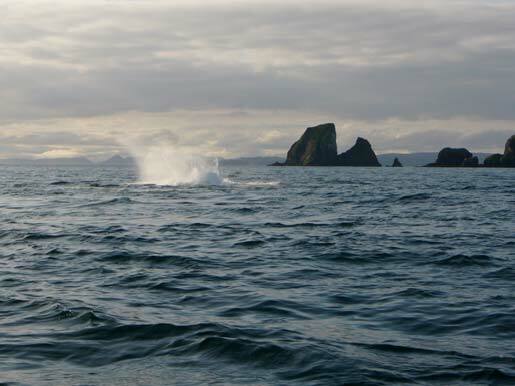 This entry was posted in 2006, Lisa Kercher, NOAA Ocean Service, NOAA Teacher at Sea and tagged Alaska, CTD, fisheries, humpback whales, Hydrographic survey, navigation, NOAA Ship Fairweather, sonar, survey launch. Bookmark the permalink.